As a birthday boy... he get to choose his favourite 'makan' for the day. So my little 'carnivore' chose...Beef Rendang, Red Curry Duck...and just to please me.. he wanted acar too (otherwise I'll nag him for not eating his vegetables!!). Hurrah!! The little carnivore was appeased for the day!! 20 dried chillies (agak-agak)- soak and blended. Blend the chillies, onion, ginger, candlenuts and lemongrass to a paste. Ground coriander seeds, cumin seeds and black pepper. Heat oil in a big pot. Add the blended and grounded spice. saute until fragrant. Then add diced beef, daun pandan and coconut milk. Bring the mixture to boil then let it simmer... Add kerisik... then stir...and stir... and stir.... it could take hours (easily 2 hrs) before the rendang thickens.... . Salt and sugar to taste. Note: kerisik - pan fried or roasted grated coconut then pound or grind into paste. 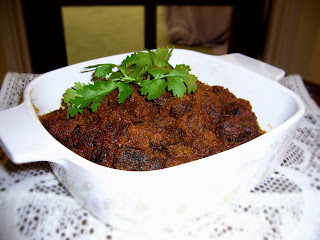 Tip: Cheat Rendang - buy a packet of Rendang ready mix from Asian Grocer - improvise with spice and kerisik. Why wasn't the birthday boy smiling? love the lanky candles!